Archaeologists may have uncovered the oldest known prehistoric school, where it seems young hominins were taught how to make flint tools, butcher animals, and master other skills necessary to survive in the Stone Age about 400,000 years ago. The discovery is so remarkable that the scientists are wondering whether it means Homo sapiens itself evolved much earlier than is currently thought. 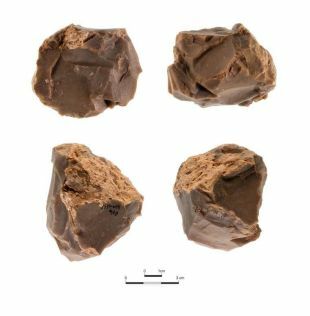 The notion that what they found was evidence of an early teaching system is based on analysis of hundreds of flint stones and fragments found in Qesem Cave, in central Israel, a spot that hominins called home from 400,000 to 200,000 years ago. The discovery may attest that our ancestors developed complex cultural patterns, such as language and knowledge transmission, much earlier than believed. That in turn adds to mounting evidence from around the world that has already pushed back the clock on the evolution of modern humans by at least 100,000 years, and challenged the idea that Homo sapiens developed in Africa. Assaf, who has been digging at Qesem since 2010, analyzed hundreds of flint items looking for signs of different skill levels by the prehistoric knappers. “Knapping is complex. It requires many different motor and cognitive skills, as well as technical and practical knowledge,” she told Haaretz. “The idea was to see if we can identify the different stages in this learning process." Among the most telling finds are flint cores that show signs of having been used by multiple people, some of whom were clearly highly skilled, while others were just beginners, Assaf explains. "Cores" are pieces of flint that were first shaped into specific forms, according to the desired tool, and were then struck to detach flakes that formed the tool itself: a blade, a scraper, a spear point and so on. 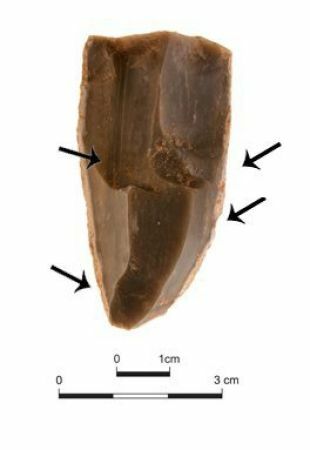 A skilled knapper could detach multiple tools from the same core, "peeling" layer after layer from the stone, in a sort of prehistoric version of mass production. The detachment would leave a scar on the core. By looking at this scar – effectively a negative image of the detached tool – researchers can tell if the process was completed successfully. Many of the cores at Qesem, so called “shared cores,” display mixed results, Assaf says. On the same stone, she can point to clean scars left by a perfectly detached flake as well as multiple signs of breakages, mistakes and failures. “If it were just one mistake, we wouldn’t know, since even experienced knappers make mistakes, but if I see repeated errors I can think that it was someone else, two different hands that knapped the same core,” she says. This is extraordinary because, for one thing, good flint was not readily available at Qesem. Researchers have found the precious raw material had to be quarried and transported from sites that were between five to 15 kilometers away. The most likely explanation for this phenomenon is that it was part of a teaching process to help children learn knapping skills, Assaf says. Further supporting her theory is the fact that these shared cores have not been found randomly strewn across the cave but concentrated in a few spots, especially around the main hearth. This is consistent with the idea that there were specific areas where learning activities were more common, something that is also common around the hearths of contemporary hunter-gatherer tribes, she notes. There are other signs of learning in Assaf’s sample of flints: half-finished or badly made tools as well as artifacts made with low-quality materials, which an expert knapper would never have selected or spent time working on. Assaf, together with Tel Aviv University archaeologists Ran Barkai and Avi Gopher, published preliminary results of her research last year in the journal Quaternary International, and hopes to complete her PhD thesis on the subject in 2018. 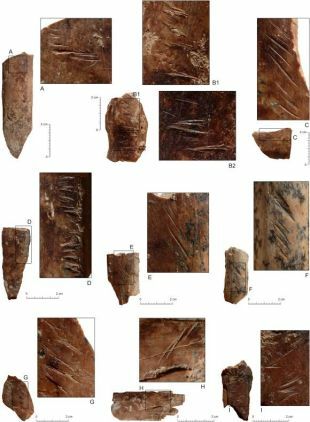 Spanish researchers have also studied the cut marks left by flint tools on the bones of butchered animals at another site, Bolomor Cave in Valencia, Spain, noting that they appear consistent throughout the 200,000 years of human habitation at the cave, again suggesting that standardized techniques – of butchering in this case – were passed down through generations. There have been other studies that indicate knowledge transmission amongst prehistoric humans. These mostly involve remains dated to the Upper Paleolithic, however, hundreds of thousands of years after Qesem’s time. The discovery of what seems to be a school for advanced flint tool-making raises the key question of how this prehistoric show-and-tell took place. Did the hominins who lived so long ago already have a language with which to teach their children? Can such complex behavior be learned just through imitation? When our ancestors began to talk is controvesial. Some researchers suggest that, at least physiologically, they may have already been speaking as early as 1.75 million years ago, as they began to create more complex and standardized tools, which required some kind of knowledge sharing. By the time hominins lived in Qesem, they had reached a key juncture in their evolution. They had developed ever more elaborate tool-making and hunting techniques; and it seems they had learned to control fire – an ability of which the earliest evidence was also found at this cave. It seems, says Assaf, that hominins would require language to spread all these newfangled abilities. 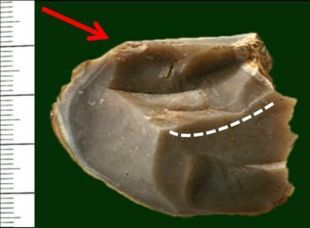 This conclusion is supported by a recent experimental study, published in Nature, which showed how even the more basic knapping techniques would be nearly impossible to learn through simple imitation. Many animals use different forms of communication. Some, like chimpanzees, can learn complex behavior through imitation, but humans are the only species known to use communication to transmit knowledge. The fact that this may already have been happening at Qesem more than 200,000 years ago, could help rewrite the history of where and when anatomically modern humans first emerged. Until recently, scholars were convinced that our species first evolved in East Africa, as the oldest Homo sapiens remains were found in Ethiopia and dated to just under 200,000 years ago. But a slew of recent discoveries is now contradicting that narrative. Earlier this year, researchers revealed they had dated a primitive Homo sapiens skull found at Jebel Irhoud in Morocco to 300,000 years ago. In another headscratcher for paleontologists, a study published this month showed remarkable similarities between the Moroccan skull and one found in China and dated to some 260,000 years ago – all before modern humans were supposed have first appeared in East Africa. We don't know who lived at Qesem itself. 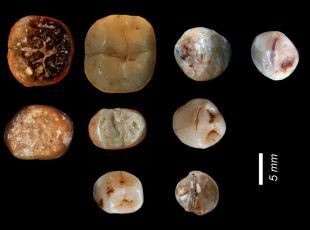 Only a handful of teeth have been recovered, not enough to conclusively determine what kind of hominin inhabited the cave. Even so, experts have pronounced the teeth to be much more similar to those of Neanderthals and Homo sapiens than to those of Homo erectus, the first hominin known to have left Africa and spread across Eurasia some 1.8 million years ago. What does all this mean? Did humans first evolve in North Africa? In the Middle East? In China? Or perhaps there are even older remains of Homo sapiens just waiting to be discovered in the African heartlands? Assaf says that at this stage it’s impossible to answer such questions, but it seems that many of the things that make us human – the ability to plan ahead, to shape our environment, to create complex and enduring societies – appeared much earlier than we previously thought.